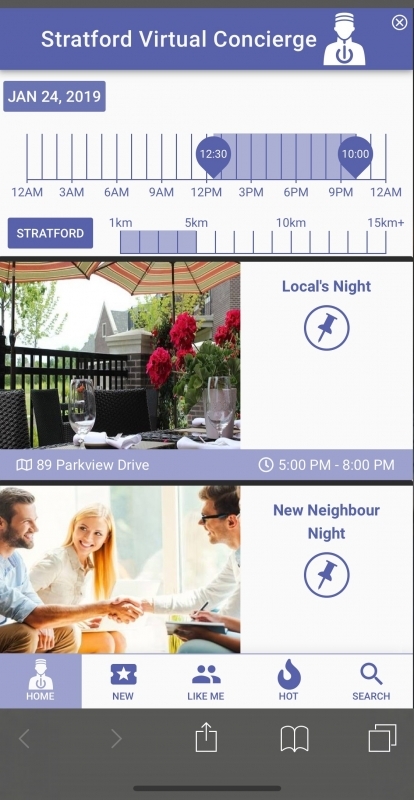 (Stratford, ON) Stratford Tourism Alliance (STA) is making Stratford a leader in tourism discovery by introducing an on-line personal discovery concierge on visitstratford.ca. Visitors to the website will be intuitively assisted with on-demand personalization and matching to relevant tourism events and partner experiences in and around Stratford. The interaction will be more rewarding and positive, encouraging more meaningful connections, longer stays, and brand loyalty from a younger demographic than the historically documented visitor. The visitor process is more fulfilling using recommendations and trending experiences for increased engagement, funnelled through a site overlay that mimics an app experience but on a Web platform. This technology is possible through a partnership with Chillwall AI, a cloud-based Desire Prediction Artificial Intelligence firm using Deep Learning analytics to aggregate, analyze, and recommend things to do in over 2,000 cities on their own site, to power the new digital concierge. Behind the scenes is where the technology is working smarter to bring important data and a better understanding of visitors’ wants and needs using proprietary technology from Chillwall. The new use of this data on VisitStratford.ca uses Chillwall AI to bring this leading Technology inside our databases of Stratford events and businesses. Increased reporting opportunities will provide more powerful insights to STA than traditional marketing research. “Stratford is one of Canada’s most unique tourism destinations. From theatre to savoury food trails to visual arts, Chillwall AI is excited to power personal discovery without searching. Visitors effortlessly experience all that Stratford has to discover” Dr. Ian Knowles and Michael Campanelli, co-founders of Chillwall AI. Using this discovery concierge, STA is tapping into the expertise of the University of Waterloo Accelerator experts, ranking in the top four best in the world during one year of intense development. We invite everyone to experience the discovery concierge at www.visitstratford.ca. Tourism-related businesses interested in learning more are invited to contact us at ac.droftartstisiv@olleh or call 519-271-5140 or contact hello@chillwall.com to create the best Stratford visitor experience possible.